Applications are invited , closing on 1 July, for projects satisfying the Policy Guidelines – 2019. An official launch is to be announced for May. The first call for applications was launched by Emeritus Prof. Trevor Clifford OAM, Honorary Life Member, the Royal Society of Queensland on 5 June 2018 at the Global Change Institute, University of Queensland in the presence of Miss Shirley Hopkins, Treasurer, Central Queensland Koala Volunteers. At the Society’s AGM on 29 November 2018, the winners of the inaugural awards were announced by Emeritus Prof. Calvin Rose AM, Life Member. Congratulations to both! Alex Jiang, University of Queensland, for an investigation of koala-cattle interactions. Powerpoint presentation herewith. Chapa Gimhani Manwaduge, Queensland University of Technology, on the conservation biology of threatened native olives (genus Notolaea) in southern Queensland. Powerpoint presentation herewith. Initiated by the Central Queensland Koala Volunteers, who wished to perpetuate their work on a wider canvas, the Society has established a trust fund to support research into the natural sciences. Donations to the fund are tax deductible (within standard ATO guidelines). The fund will aim to support projects which escape the attention of the mainstream grant programs like those of the Australian Research Council. Applications for small-scale projects such as those by NGO groups or early career researchers are encouraged. Early in March 2018, the fund passed the minimum threshold for capital above which grants can be issued. The Trustees authorised release of $5000 per year for three years. 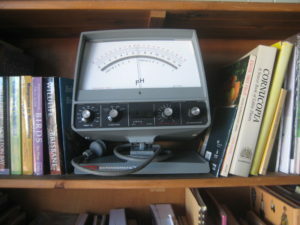 Prospective donors are invited to consult the prospectus . Prospective applicants are invited to consult the formal Policy Guidelines . 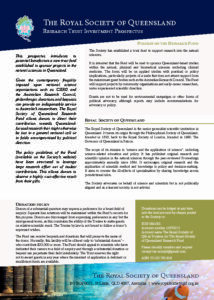 The Council of the Royal Society of Queensland pro tem is Trustee of the Research Fund. The Research Fund has a Australian Business Number and has been registered as a charity with the Australian Charities and Not-for-profits Commission. Donations can be lodged at any time into the trust account: BSB 064-001, Account number 11970213. Deposits can be made at any branch of the Commonwealth Bank or online. Please mark the transfer with an identifying name and send a specific request to the Society for a receipt. (Please do not pay into the Society’s mainstream account as general donations to the Society are not tax deductible). 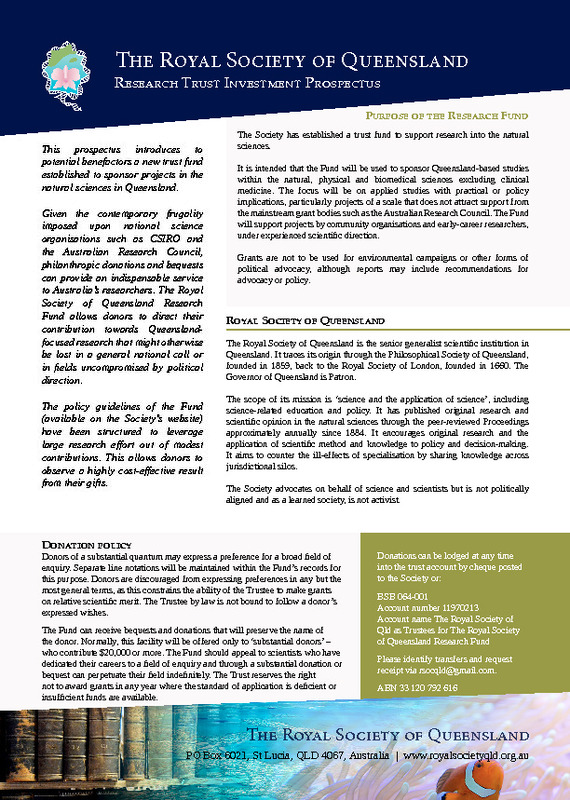 The formal name of the account is THE ROYAL SOCIETY OF QLD AS TRUSTEES FOR THE ROYAL SOCIETY OF QUEENSLAND RESEARCH FUND account. The name has been specified by the bank in conjunction with the new banking laws requiring that account names accurately reflect the registered entity. Anyone who would like to know more about this inspiring opportunity to advance science is invited to contact the President, president@royalsocietyqld.org.au to discuss how your name and scientific interests might be perpetuated. Jill Landsberg Trust Fund Scholarships: An annual grant for research in terrestrial, marine or freshwater ecology. Australian Wildlife Society University Grants. Grant opportunities from the Commonwealth Government (notably the Prime Minister’s Prizes for Science, GO103).